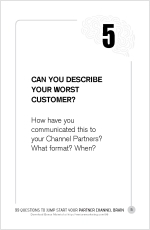 Profile of your worst customer - What should Channel Partners know? Home → Uncategorized → Can you describe your worst customer? Allow me to paraphrase some things from one of my favorite books and then I’ll let you be the judge if this describes you and your company’s “relationship” with your worst customers. Looking back, before you really got to know them, your worst customers may have been the most enjoyable creatures on earth. They may have been witty, charming and engaging. Some were humble. Many insisted on picking up the tab. During the getting-to-know-you phase, your team did all the normal things to vet the company. Credit reports, testimonials, references. Everything seemed pretty normal. But you know something isn’t right now. Somehow, it’s costing you more to service this client than you’re making. The problem is that you and your staff are literally exhausted at the end of each day. Somehow, you went from vendor to “partner” to servant/slave. You wish you could unwind the relationship, but you’re trapped. And with a third party in the mixture (i.e., your Channel Partners), it’s a hot mess. Navigating your way out of this situation requires painful decisions and a change in behavior. If you haven’t experienced this in your business, count your blessings. More than likely you don’t suffer from the very thing that’s causing this situation—lack of healthy boundaries. Somehow in the spirit of servicing our clients we forget to set proper boundaries. We keep giving and they keep taking. We believe it’s our job as sales and marketing professionals to say, “Yes.” Customer needs something…Yes. Client expects free shipping…Yes. Train their staff at no cost…Yes. …. Yes, yes, yes! No surprise, these problem-child clients are our own creation. I’m sure when Matthew Dixon and Brent Adamson of CEB wrote The Challenger Sale they weren’t thinking about codependent customer/vendors, but nonetheless, their book is a manual for setting healthy boundaries in your customer relationships. “Challenger” sales reps are defined by their ability to teach, tailor and take control—through the use of constructive tension. As it turns out, Challenger reps are the most productive and successful of all types of sellers. They have an edge about them. Clients respect them. And guess what? When clients respect your sales reps it’s natural for clients to respect your whole company, too. Nice (no-cost) benefit! The good news about Challenger Sales is that it can be taught to the entire sales team. You don’t have to hire new sales reps to sell this way. I’ll leave it up to you to create your own list of warning signs of a bad customer, if you believe you need one. But the better advice is to focus on yourself and your team. Adopt the Challenger Sale methodology. Create constructive tension. Set good boundaries. Teach clients things about their own businesses they don’t already know. And for heaven’s sake, include your Channel Partners. They’ll eat it up. These are the things that will prevent you and your Partners from magnetically attracting customers that add little or no value to your bottom line.